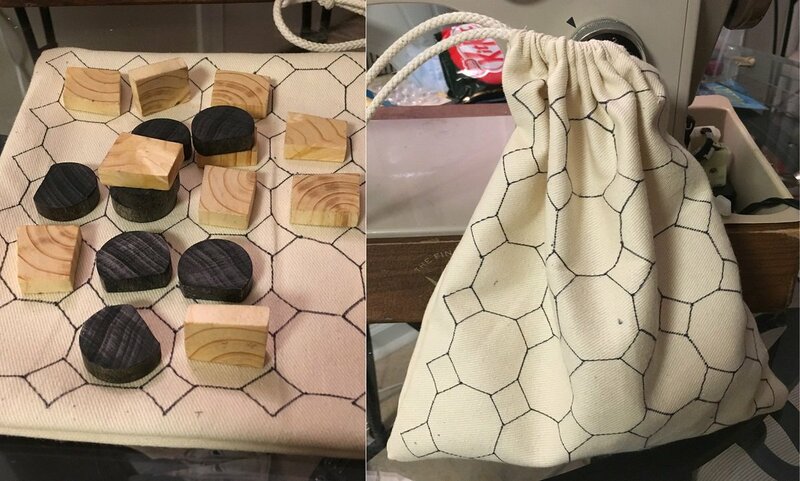 We’ve had great response to Devi’s Box and Devi's Board, and today we’d like to talk about an accessory at the other end of the price scale: a cloth board for Tak. We’ve been working on this option since long before the campaign, but we couldn’t come up with a satisfactory solution until now. We know it’s a popular concept, so we have burned some midnight oil looking for a board that works. And we've finally found a supplier worthy to make this fine thing. First, a caveat. A cloth board is never going to be perfect. Even in the best conditions, standing stones on a cloth board will be a little unstable. If the board has a wrinkle or a fold, or if the underlying surface is soft, you may have a hard time placing a wall. Despite the drawbacks, there are also clear advantages to a cloth board, because it’s wonderfully portable and inexpensive. A decent traveling board can be an excellent accessory, and the cloth board we have chosen has the best combination of price, quality and stability. We looked at some high-priced options for the fabric and printing, but we’ve decided to keep this cloth board affordable by going with a simple one-color printed bandanna, 14” square, available as an add-on for $9 (plus shipping). These bandannas are 100% cotton, made in China, and printed in the USA. You can add this board to your pledge during the campaign, or through the pledge manager after the campaign ends. The cloth is light, so it probably won't add to your shipping cost, but only the pledge manager knows for sure. This is an early sketch, but it gives you a sense of where we are heading. We went with a 5x5 board because we expect that the cloth board will most likely be paired with a Tavern Set, which has only enough pieces for 5x5. In this pseudo-hybrid design it's easy to see a 4x4 board on the spaces between the leaves. If you want to play 6x6, you can augment the inner 4x4 grid with the circles that line the inner square. Many backers have asked if this board could also transform into a bag, but that’s just not practical. We don’t have a good source for specialty cloth manufacturing (these are printed bandannas, which is simpler) but more important, there isn’t a good pattern that works as both a bag and a board. However, it’s simple enough to tie this bandanna around your pieces, bindle-style, if you decide to forego the traditional drawstring bag. The folks at Wyrmwood were nice enough to put together a presentation video for Devi’s Box (below). Note that in this video, the piece colors have been updated: we now have bloodwood rounds vs. maple trapezoids. We think this is closer to what Devi would play with (blood vs. money). Take a look! Devi's Box is a brilliant piece of work, and we are thrilled to have generated so much demand for it. As this video shows, you will not be disappointed. Note: we have now decided to include a certificate of authenticity in Devi's box, signed by Patrick and James, as a little upgrade to say "thanks for loving it!" We made some new friends while setting up this campaign, and we wanted to give them a mention. Unrelated to the Kingkiller Chronicles, Twizmo Games and designer Rich Zeglovitch created a new game called "tak-tak." It's a two-player abstract strategy game that could easily be mistaken for Tak, if it didn't have entirely different rules. Rich's game title comes from "stack and attack," and it's pretty clearly a case of simultaneous development with our game. But since their game was already for sale when ours was still in open beta, they could have decided to send their lawyers at us. Instead, all the business entities involved have agreed to peacefully coexist, and we think that's just better for everyone. If you're curious about abstract strategy games, you should definitely check out tak-tak. We have some nice early sketches from Echo Chernik for the Classic Set board, and we should have something to share with you soon. She’s creating a rich, intricate design resembling exotic wood inlays, with daisies and Selas flowers. We have only seven days left on the Kickstarter campaign, so please tell your friends and let’s push for that one million mark. It’s not impossible… and we have some nice upgrades to announce when we get closer to the line. Jayce Pentad, Luke Walker, and 41 more people like this update. https://pbs.twimg.com/media/ChJzke4VEAAlBcJ.jpg came to my mind (that board/bag is not mine, I just found it searching for tak on the internet, honestly can't remember where). If you had not seen this before, what do you think? Could the bag of the tavern set and Crazy Martin have this pattern? And if you had already seen this, why is not practical? For me it seems pretty handy, you could just take the bag with the pieces and play in any flat surface you encounter. Congratulations for such a succesful campaing and thanks for your amazing work! The design for the cloth board is so nice that I'm thinking I'll add-on two cloth boards and use one to make a carrying bag! The cloth board is going to be very useful for Tak and Pyramid Arcade! Brilliant! Good thought, thanks for mentioning it. Olman - If the need arises, we will pay for round trip shipping as we repair or replace the piece. Everything Wyrmwood creates is made for a lifetime of gaming. Yes yes yes yes!! You guys rock!! That video was amazing! And on top of that, my box comes with a signed CoA? fantastic news. Love the design on the cloth board. Keep up the good work guys, and thanks! @creator Thank you for the response! I think this board is so amazing, and I'm also glad the game looks to support future special high end boards. We aren't very GOOD at it here at, but it's a very enjoyable game! It's very nice to hear about the lifetime guarantee. Is it applied also for international shipments? Can we get more infor how will the fixing procedure be done in such cases? @Simon York: I'm sure that's something you could pick up at a local craft store for less than it would cost through here. I KNOW that you can get grommets (brass lacing holes) that would punch right through the cloth board. Pick up grommets and a strip of leather and you can turn your cloth board into your own Tak Bag. Me, I'm going to fold it up and stick it in the bag with my Crazy Martin set. HOLY!! Devi's Box looks AMAZING!!! So tempted right now, especially with the Certificate of Authenticity. Great work everyone! How about adding a piece of leather string (like a lace) to the cloth board option to tie it up bindle style? could be a stretch goal? @Olna: I'm pretty sure that Wyrmwood would be happy to accommodate a special request for Devi's Box, considering your allergies, but just to be safe you should verify that with them before you order it. Even if that doesn't work out, they'll almost certainly be making different boxes in 2017. Oh, for an edit button. *rueful* I come into this kickstarter from the Cheapass games vector, and haven't read the books. I have been educated that there's a character-based reason for the lavender scent, so I retract the word "unnecessary". I'll just hope that maybe Wyrmwood will be involved in a future fancy set, because I like their work a lot. Thank you for the video. I'm very disappointed by the unnecessary addition of an allergen, but at least now I know not to spend hundreds of dollars on something that will make me very ill.
Can anyone confirm that the standard wood pieces will NOT be saturated with lavender oil? It's not what I was expecting -- a standard Tak board layout -- but I love it! =D It's so pretty~ And so affordable I can probably get one of these, too. Really sad I can only afford the book -- and only because I'm being stubborn about it; the shipping is more than the book! @__@ Someone needs to have a chat with the USPS! :P -- but I found a great little random chunk of idk what at the local hardware store. It's in another language. And the pictures don't help much. But it's pretty much perfect for a Merchant piece stencil! =D And on the 'deleted stock' cart, it only cost me $2! :D But I'm really looking forward to designing my own custom-but-still-recognisable pieces and picking out the wood for them! The brown/gold of the cloth map looks really nice, and suits the oak theme well~ n__n I'm really happy I'll be able to get a board as well. I love how you cleverly incorporated the circles to enable a 6x6 game! =D This rocks! Even if I have to find/bring a hard surface with me :P -- fold-up board game surface? There's gotta be a good sized one that would work for this. It would be great if you did a leather pouch that held the pieces, but became a board when opened all the way. It would be a much sturdier board than the cloth. @Cheapass Games: Excellent! That is good to hear, and I look forward to seeing what they come up with! Ok, that's awesome the other game maker is saying live and let live :) Love it when a company is sane. Cloth board looks pretty great, and seems like a good compromise between affordability, travel, and simply being able to get it done in time. Although I am a little disappointed it doesn't cinch down into a bag...but I imagine I can still put the pieces in it and tie opposite corners together. @Robert: Wyrmwood are actually working on a design for a leather board but they will not be ready for this campaign. Rest assured, that option and many others will emerge in good time. I think that would pair very well with the tavern set, as it would fit in a standard playmat tube for easy transport. Watching the video of Devi's box makes me even more excited. I love the blood vs. money thought. I would love to see a cloth board that has string to turn it into a bag to hold the stones. Oh man, that video on Devi's Box... so tempted now to move up to it. So excited! I decided to go all out and get Devi's box and had planned on trying to get it signed and you must have been reading my mind! Lovely and an instant add-on for me! Thank you! Very nice. Love the concept for the spaces, as opposed to the "hard" boards!